We have all dreamed of traveling in a Time Machine to change our past and to experience our future. Time Machine was made famous by the book “The Time Machine” by H.G.Wells. It is probably the most read book by everyone interested in Time Travel and by everyone who wants to understand Einstein’s Theory of Relativity and it’s possible utility. But can Time Machine ever be made? Is Time Travel possible? Einstein’s Theory of Relativity explains that ‘Time” is Relative and not an absolute unit of measurement. It was based on the observation that light seems to travel at the same speed irrespective of its direction with respect to observer. He made the conclusion that time must slow down or run fast with respect to the observer to have this effect. But Time is Relative also implies that Time is Absolute. Time is always relative to it’s space. This is where we get ‘space/time” as a unit for physical measurements. When we consider time, it must also accompany its space. That means Time is always absolute in its respective space/time and moves in forward direction. In my last blog, Souls, Ghosts and Medical mysteries – MPD, I had mentioned that we may be able to travel in constant time anywhere in the Universe instead of the limiting speed of light. Based on this observation, we will see examples where we teleport a person from one space/time zone to another instantaneously. Eg.1 : If we send two clocks in sync in two different space/time zones, they will get out of sync with each other. But they will always tick the same in their respective space/time zones and not run fast or slow. Eg.2 : Now in above example, we teleport a person from one space/time zone to another, fast or slow does not matter, his clock will tick the same and not slow or fast. This person will not realize the difference in speed of time! 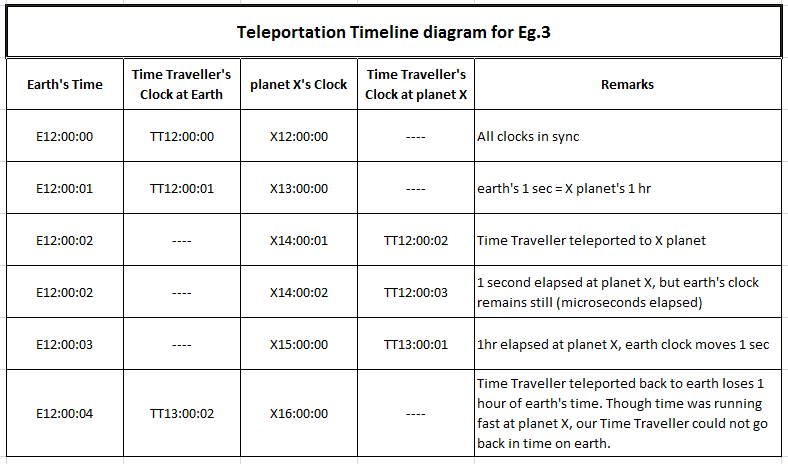 Eg.3 : Now consider that one clock tick on Earth is equal to one hour in X space/time zone. Time runs fast there. We have placed synced clocks at both places and one with the person. Now we teleport a person from Earth to that time zone at 2 second. He will see that his clock ticks 2sec, 3sec.. as if nothing had happened. But he will see that the clock at that place ticks 2hr-1sec ahead of his clock. Now he comes back to earth after spending 1hr at X space/time zone but only 4sec elapse on Earth clock. This means, though the time was running really slow on earth, he cannot go back in time on earth. He also did not realize any change in speed of time, only that he may have to reset his clocks to match that space/time zone. Eg.4 : Now consider that one hour on Earth is equal to one second in X space/time zone. Time runs slow there. Now the person on earth after 2hrs teleports to that X space/time zone. He will see that his clock ticks 2hr as usual, but clocks there is ticking 2sec. Now he teleports back to earth at 4sec of that place and 2hr3sec of his clock. He will see that his clock ticks 2hr3sec, but earth clock moves 4hrs. Here again though the time at the X space/time was running really fast he could not go to future on earth. Time is always constant/absolute in its space/time. There is no way of going back in past. There is no way of going into the future. Wherever we go, at any space/time zone we will always go in its present. We may gain or lose time, but can’t go in future or past. Time Machine will always remain a fiction. We will need to reset our clocks to that space/time similar to the way we do when we travel from one time zone to other on earth. Space is absolute, Time is absolute, Space/Time is absolute in their own frames of references and relative to other frames of references. There is/are no parallel universe(s), spliced like pieces of bread on a timeline. We can safely carry a clock corresponding to the speed of clock of other space/time zone and it’s time will not become fast or slow, unless their relative time changes. This can be observed from above examples if we keep X location clock on earth and vice versa. Time will never become negative. There is popular misconception that time will become negative beyond the speed of light. We can use above example to increase the time difference from 1hr to 1day, 1month, 1year and so on. It will just look infinite which our mathematics already shows. That light coming from all stars will have red shift Doppler effect as time will run faster on the star with higher gravity than in space giving the effect of moving away. Thus the conclusion that Universe is expanding based on the red shift Doppler effect of light coming from stars is wrong. This is known as gravitational red shift or relativistic Doppler effect. There are other reasons for expanding Universe theory. The book “The Time Machine” by H. G. Wells has probably mislead everyone for more than a century. We can observe that it was published in 1895. Einstein’s paper on special theory of relativity published on 1905 and he worked on general theory of relativity between 1907-1915. The above inferences may probably be the reason Einstein never himself talked of time travel in his lifetime. Theory of relativity does not by itself support time travel. It is a wishful possibility of this theory. Most scientists did come to the conclusion that we may not be able to travel back in time. But they have not yet realized that we cannot travel in future either! In my earlier blog, Time Machine is here!, I did come to the conclusion that “Time Travel” is probably not possible. But it was based on an orthodox(?) method called lexigram from Linda Goodman’s book star signs. That does not leave us hopeless though. Now we know that it is safe to travel in any space/time zone and we will always come back to the present and not in any parallel universe. We know that we only need to reset our clocks to match the space/time zone, which we already do on earth when we travel from one time zone to another. Our example of teleporting in constant time can give more insights on understanding space/time and make hypothetical calculations beyond speed of light simpler. Actually no calculations are involved (for understanding) as neither speed nor mass nor light is involved. Credits and Thanks : I would like to thank Sir Larry Randles Lagerstrom, Director of Online Learning at Stanford University, for the online course “Understanding Einstein and Special Theory of Relativity” on coursera.org. His simple lectures made me understand this complex topic and the examples of simultaneous clocks really helped. (I could not complete that course online but watched the videos lectures from its archives. I also did not do the mathematics involved latter in the lectures. So any flaws in this blog are all mine.) I would also give thank Stephen Hawking for his interesting, simple and informative books “The Grand Design” and “A Brief History of Time”. Of course Albert Einstein for the most interesting discovery of all “TIME”. For the Time Traveler, he can travel in future but not in past. The Time Traveler will always come to present time on earth or any space/time zone he goes. The Time Traveler gains and loses time depending on the relative time difference of space/time zones. It makes Relativity easier for everyone to understand. 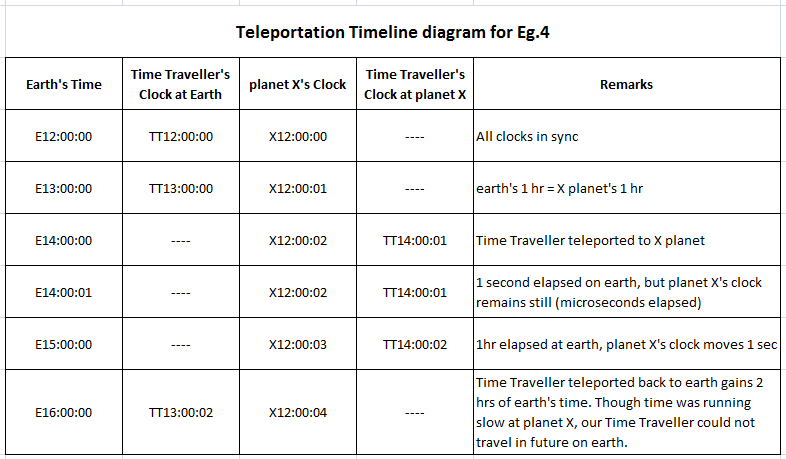 Brings teleportation and time line diagram as another tool to understand Relativity. Makes calculations at infinity easier to understand without complex mathematics.